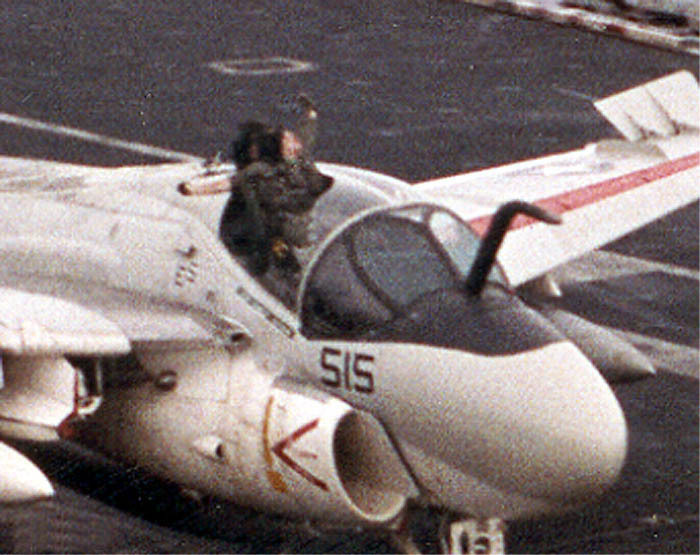 LT Keith Gallagher is seen above the canopy as the A-6 aircraft touches down on the deck of the Lincoln. This is a true story about my cousin - Keith Gallagher surviving a very unusual and life threatening incident while serving as bombardier navigator on a A-6 aircraft off the USS Abraham Lincoln in the Indian Ocean on July 9, 1991. Keith would recover from this accident, return to flight status, and complete his service in the Navy. 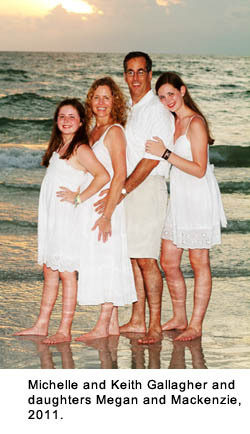 Keith now works in the telecommunications industry and lives in Atlanta with his wife Michelle and their two children. Editor's Note: The aircraft in this story is a Green Lizard KA-6D aerial tanker and this was a aerial refueling mission overhead the carrier. On July 9, 1991 the USS Abraham Lincoln is four days out of Singapore heading northwest for patrol duty in the Persian Gulf. "abeam" - a direction 90 degrees (perpendicular) to the side of the ship. "boat" - any navy ship, the aircraft carrier is "THE Boat". "Bravo Zulu" - praise for a good job. "NATOPS - The Naval Air Training and Operating Procedures Standardization program, responsible for rules and regulations governing safe and correct operation of all naval aircraft, (sometimes used in jest to mean "Not Applicable to Our Present Situation"). As we finished the brief, my BN (bombardier navigator - Lt. Keith Gallagher) told me that it was his birthday and that our recovery would be his 100th trap on the boat. To top it off, we were assigned the plane with my name on the side. As we taxied out of the chocks, I was still feeling a little uneasy about all the recent mishaps. To make myself feel better, I went through the "soft shot/engine failure on takeoff" EPs (emergency procedures), touching each switch or lever as I went through the steps. "At least if something happens right off the bat, I'll be ready," I thought. The first few minutes of the hop were busy. Concentrating on the package-check and consolidation, as well as trying to keep track of my initial customers, dispelled my uneasiness. Editor's Note: The KA-6D is a tanker version of the A-6 Intruder. A total of 90 KA-6Ds were produced by Grumman for the Navy by modifying existing Intruder airframes. To make the conversion, certain radar and bombing equipment is removed and replaced with an internal hose-and-reel refueling package, with the drogue fairing protruding from underneath the rear fuselage. The KA-6D retained a visual bombing capability (which was seldom exercised). 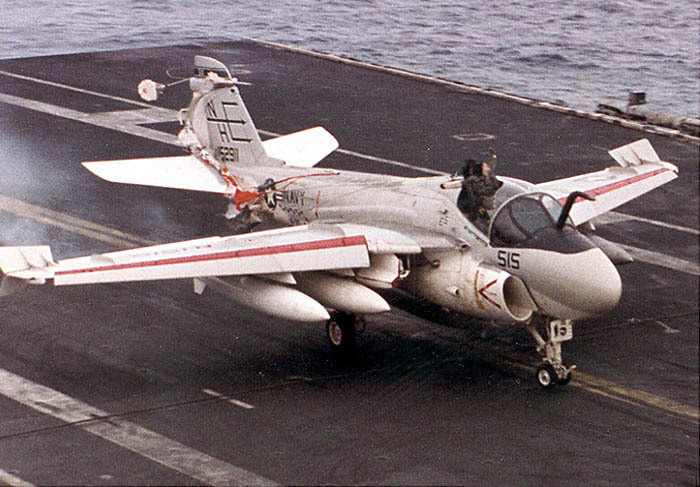 The A-6 had a long and outstanding record of reliable service for the Navy from 1963 to 1997. As we approached mid-cycle, that most boring time in a tanker hop, we kept ourselves occupied with fuel checks. We were keeping a close eye on one drop tank that had quit transferring with about 1,000 pounds of fuel still inside. I had tried going to override on the tank pressurization, but that didn't seem to work. My BN and I discussed the problem. We decided it was probably a stuck float valve. Perhaps some positive and negative G would fix it. We were at 8,000 feet, seven miles abeam the ship, heading aft. I clicked the altitude hold off and added some power to give us a little more G.
At 230 knots I pulled the stick back and got the plane five degrees nose up. Then I pushed the stick forward. I got about half a negative G, just enough to float me in the seat. I heard a sharp bang and felt the cockpit instantly depressurize. The roar of the wind followed. I ducked instinctively and looked up at the canopy expecting it to be partly open. Something was wrong. Instead of seeing a two or three inch gap, the canopy bow was flush with the front of the windscreen. My eyes tracked down to the canopy switch. It was up. My scan continued right. Instead of meeting my BN's questioning glance, I saw a pair of legs at my eye level. The right side of the canopy was shattered. I followed the legs up and saw the rest of my BN's body out in the windblast. I watched as his head snapped down and then back up, and his helmet and oxygen mask disappeared. They didn't fly off; they just disappeared. My mind went into fast forward. "What the hell happened?" I wondered. "I hope he ejects all the way. What am I going to do now? I need to slow down." I jerked the throttles to idle and started the speed brakes out. Without stopping, I reached up, de-isolated, and threw the flap lever to the down position. I reached over and grabbed for the IFF selector switch and twisted it to EMER. I was screaming "Slow down! Slow down!" to myself as I looked up at the airspeed indicator and gave another pull back on the throttles and speed brakes. The airspeed was passing 200 knots. I had been looking back over my shoulder at my bombardier the whole time I was doing everything else. I felt a strange combination of fear, helplessness and revulsion as I watched his body slam around in the windblast. After his helmet flew off, his face looked like the people who get sucked out into zero atmosphere in some of the more graphic movies. His eyes were being blasted open, his cheeks and lips were puffed out to an impossible size and the tendons in his neck looked like they were about to bust through his skin as he fought for his life. At 200 knots I saw his arms pulled up in front of his face and he was clawing behind his head. For a moment, I thought he was going to manage to pull the handle and get clear of the plane. I was mentally cheering for him. His arms got yanked down by the blast and I cursed as I checked my radio selector switch to radio 1. "Mayday, Mayday, this is 515. My BN has partially ejected. I need an emergency pull-forward!" The reply was an immediate, "Roger, switch button six." I switched freqs and said (or maybe yelled), "Boss (Air Officer), this is 515. My BN has partially ejected. I need an emergency pull-forward!" I slapped the gear handle down and turned all my dumps on (in an effort to get slower, max trap never crossed my mind). The Boss came back in his ever-calm voice and said, "Bring it on in." As I watched, the indexers move from on-speed to a green chevron I worked the nose to keep the plane as slow as possible and still flying. The plane was holding at around 160 knots and descending. My BN's legs were kicking, which gave me some comfort; he was not dead. But, watching his head and body jerked around in the windblast, being literally beaten to death, made me ill. I had been arcing around in my descent and was still at seven miles. The boss came up and asked if the BN was still with the aircraft. I think that I caused a few cases of nausea when I answered, "Only his legs are still inside the cockpit." It made sense to me, but more than a few people who were listening had visions of two legs and lots of blood and no body. Fortunately, the Boss understood what I meant. Editor's Note: In the sound clip below, the pilot asks "How's the deck looking? ", meaning is the deck clear and ready for an emergency landing. You also hear the Boss attempt to better understand the situation by first asking the pilot a question and then he contacts other aircraft in the area. As I turned in astern the boat, I called the Boss and told him I was six miles behind the boat. I asked how the deck was coming. He asked if I was setting myself up for a straight-in. I told him "yes." He told me to continue. It was then I noticed that my BN had quit kicking. A chill shot through my body and I looked back at him. What I saw scared me even more. His head was turned to the left and laying on his left shoulder. He was starting to turn gray. Maybe he had broken his neck and was dead. Bringing back a body that was a friend only minutes before was not a comfortable thought. I forced myself not to look at my bombardier after that. The front windscreen started to fog up about four miles behind the boat. I cranked the defog all the way and was getting ready to unstrap my shoulder harness so I could wipe off the glass when it finally started clearing. I saw the boat making a hard left turn. I made some disparaging remarks about the guys on the bridge as I rolled right to chase centerline. I heard CAG paddles (landing signal officer) come up on the radio. He told the captain he would take the winds and that he needed to steady up. My tension eased slightly as I saw mother begin to leave her wake in a straight line. I was driving it in at about 300 feet. I had been in a slight descent and wasn't willing to add enough power to climb back up to a normal straight-in altitude for fear I would have to accelerate and do more damage to my already battered BN. I watched the ball move up to red and then move slowly up towards the center. Paddles called for some rudder and told me not to go high. My scan went immediately to the 1-wire. I had no intention of passing up any "perfectly good wires." I touched down short of the 1-wire and sucked the throttles to idle. The canopy shards directly in front of the BN's chest looked like a butcher's knife collection. I was very concerned that the deceleration of the trap was going to throw him into the jagged edge of the canopy. I cringed when I didn't immediately feel the tug of the wire. I pulled the stick into my lap as paddles was calling for attitude. I got the nose gear off the deck and then felt the hook catch a wire. Editor's note: In the sound clip below, listen to landing signal officer, "paddles" make requests to the Tower and the Captain to "steady out" or "steady up". The Captain is turning the ship to face the wind, but there is not enough time and paddles is saying "I'll take the wind", meaning straighten the ship (steady up) and I will take the wind direction as it is. Also, at the very end of the audio clip, the call by paddles for "attitude" is an urgent request to the pilot to raise the nose of the aircraft so the hook in back is low enough to catch a wire. I breathed a sigh of relief. Testing the spool-up time of a pair of J-52s as I rolled off the end of the angle was not the way I wanted to end an already bad hop. Editor's note: In the sound clip below, the rescue aircraft on the Lincoln have been advised of an "ejection" and are preparing for a water rescue. Here they are updated on the current status. As soon as I stopped, I set the parking brake and a yellow shirt gave me the signal to kill my No. 2 engine. Immediately after that, I heard a call over the radio that I was chocked. I killed no. 1 and began unstrapping. As soon as I was free of my seat (I somehow remembered to safe it), I reached over and safed the BN's lower handle, undid his lower koch fittings and reached up to try to safe his upper handle. As I was crawling up, I saw that his upper handle was already safed. I started to release his upper koch fittings but decided they were holding him in and I didn't want him to fall against the razor-sharp plexiglas on his side. I got back on my side of the cockpit, held his left arm and hand, and waited for the medical people to arrive. I realized he still was alive when he said, "Am I on the flight deck?" A wave of indescribable relief washed over me as I talked to him while the crash crew worked to truss him up and pull him out of the seat. Once he was clear of the plane, they towed me out of the landing area and parked me. A plane captain bumped the canopy open by hand far enough that I could squeeze out. I headed straight for medical without looking back at the plane. Later, I found that ignorance can be bliss. I didn't know two things while I was flying. First, the BN's parachute had deployed and wrapped itself around the tail section of the plane. Second, the timing release mechanism had fired and released the BN from the seat. The only things keeping him in the plane were the parachute risers holding him against the back of the seat (see Technical Aspects of LT Gallagher's Mishap by a Navy Technician). 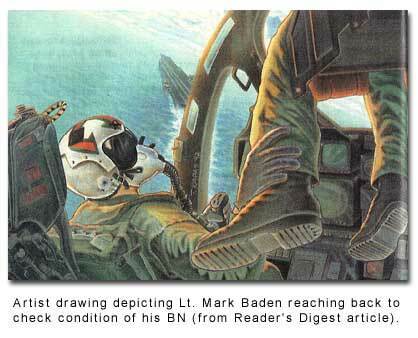 Editor's Note: Lt. Mark Baden was awarded the Air Medal for his decisive action on that day. The LSO, LCDR Mike Manazir, received the "Bug Roach Paddles Award" for his part in the recovery. The crew of the Lincoln was recognized for a well- executed emergency pull-forward - LT Baden had the jet on deck about six minutes after the emergency began. The Captain of the Lincoln would later read over the PA system, a portion of a letter written by Michelle Gallagher (LT Gallagher's wife) where she thanked the crew of the Lincoln for saving her husband's life. Lt. Mark Baden is currently a pilot with United Airlines. Murphy's Law says, "Whatever can go wrong, will, and when you least expect it." (And, of course, we all know that Murphy was an aviator.) Murphy was correct beyond his wildest dreams in my case. Fortunately for me, however, he failed to follow through. On my 26th birthday I was blindsided by a piece of bad luck the size of Texas that should have killed me. Luckily, it was followed immediately by a whole slew of miracles that allowed me to be around for my 27th. Not even Murphy could have conceived of such a bizarre accident (many people still find it hard to believe), and the fact that I am here to write about it makes it that much more bizarre. We were the overhead tanker, one third of the way through cruise, making circles in the sky. Although the tanker pattern can be pretty boring midway through the cycle, we were alert and maintaining a good lookout doctrine because our airwing had a midair less than a week before, and we did not want to repeat. We felt we were ready for "any" emergency: fire lights, hydraulic failures and fuel transfer problems. Bring 'em on! We were ready for them. After all, how much trouble can two JO's get in overhead the ship? After my third fuel update call, we decided that the left outboard drop was going to require a little help in order to transfer. NATOPS recommends applying positive and negative G to force the valve open. As the pilot pulled the stick back I wondered how many times we would have to porpoise the nose of the plane before the valve opened. As he moved the stick forward, I felt the familiar sensation of negative "G", and then something strange happened: my head touched the canopy. For a brief moment I thought that I had failed to tighten my lap belts, but I knew that wasn’t true. Before I could complete that thought, there was a loud bang, followed by wind, noise, disorientation and more wind, wind, wind. Confusion reigned in my mind as I was forced back against my seat, head against the headrest, arms out behind me, the wind roaring in my head, pounding against my body. "Did the canopy blow off? Did I eject? Did my windscreen implode?" All of these questions occurred to me amidst the pandemonium in my mind and over my body. These questions were quickly answered, and replaced by a thousand more, as I looked down and saw a sight that I will never forget: the top of the canopy, close enough to touch, and through the canopy I could see the top of my pilot's helmet. It took a few moments for this image to sink into my suddenly overloaded brain. This was worse than I ever could have imagined - I was sitting on top of a flying A-6! Pain, confusion, panic, fear and denial surged through my brain and body as a new development occurred to me: I couldn't breathe. My helmet and mask had ripped off my head, and without them, the full force of the wind was hitting me square in the face. It was like trying to drink through a fire hose. I couldn't seem to get a breath of air amidst the wind. My arms were dragging along behind me until I managed to pull both of them into my chest and hold them there. I tried to think for a second as I continued my attempts to breathe. For some reason, it never occurred to me that my pilot would be trying to land. I just never thought about it. I finally decided that the only thing that I could do was eject. (What else could I do?) I grabbed the lower handle with both hands and pulled-it wouldn't budge. With a little more panic induced strength I tried again, but to no avail. The handle was not going to move. I attempted to reach the upper handle but the wind prevented me from getting a hand on it. As a matter of fact, all that I could do was hold my arms into my chest. If either of them slid out into the wind stream, they immediately flailed out behind me, and that was definitely not good. The wind had become physically and emotionally overwhelming. It pounded against my face and body like a huge wall of water that wouldn't stop. The roaring in my ears confused me, the pressure in my mouth prevented me from breathing, and the pounding on my eyes kept me from seeing. Time had lost all meaning. For all I knew, I could have been sitting there for seconds or for hours. I was suffocating, and I couldn't seem to get a breath. I wish I could say that my last thoughts were of my wife, but as I felt myself blacking out, all I said was, "I don't want to die." LT Gallagher's upper-body and arm are seen above the canopy as the A-6 comes in for an emergency landing. 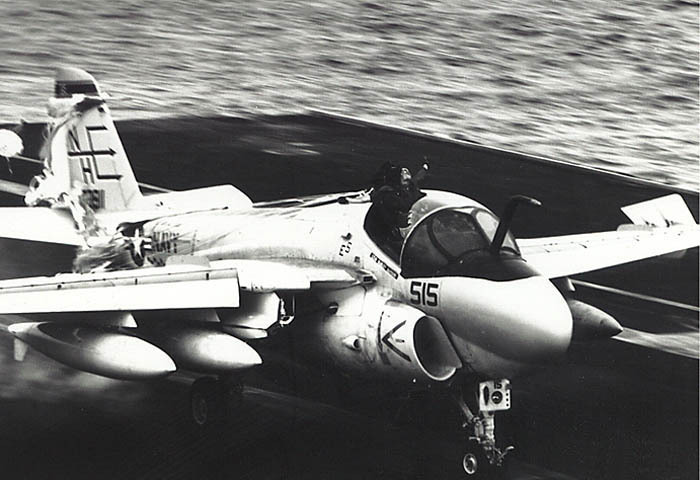 LT Gallagher is unconscious and his arms are outstretched from the wind blast as the A-6 lands on the deck of the Lincoln. Someone turned on the lights and I had a funny view of the front end of an A-6, with jagged plexiglas where my half of the canopy was supposed to be. Looking down from the top of the jet, I was surprised to find the plane stopped on the flight deck with about 100 people looking up at me. (I guess I was surprised because I had expected to see the pearly gates and some dead relatives.) My first thought was that we had never taken off, that something had happened before the catapult. Then everything came flooding back into my brain, the wind, the noise and the confusion. As my pilot spoke to me and the medical people swarmed all over me, I realized that I had survived, I was alive. It didn't take me very long to realize that I was a very lucky man, but as I heard more details, I found out how lucky I was. For example, my parachute became entangled in the horizontal stabilizer tight enough to act as a shoulder harness for the trap, but not tight enough to bind the flight controls. 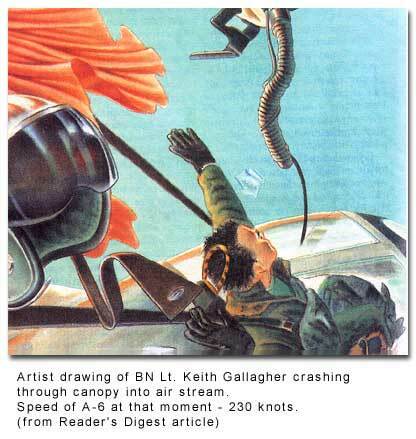 If this had not happened, I would have been thrown into the jagged plexiglas during the trap as my shoulder harness had been disconnected from the seat as the parachute deployed (see Technical Aspects of LT Gallagher's Mishap by a Navy Technician). There are many other things that happened, or didn't happen, that allowed me to survive this mishap, some of them only inches away from disaster. These little things, and a s-hot, level headed pilot who reacted quickly and correctly are the reason that I am alive and flying today. Also, a generous helping of good old-fashioned Irish luck didn't hurt. Editor's Note: The text above was written by Lt. Mark Baden and Lt. Keith Gallagher and originally published in Approach Magazine in November, 1991. View more stories from Approach Magazine - Navy Publication. My most serious injury was that 1/2 my right arm (the shoulder, bicep, and forearm) was paralyzed due to a stretched nerve in my shoulder. In addition, my left shoulder was damaged as well. I have all of the damage of someone who dislocated his shoulder, but it was not dislocated when I landed. My supposition is that it dislocated, and popped back in upon landing. Other than that, I was just extremely beat up. Via physical therapy, I recovered within 6 months. My right shoulder "came back" in about 1 month, my forearm in about 2-3 months, and my bicep returned in about 4-5 months. I had to re-do all of my physiological qualifications (swimming, etc) to prove that I was OK, but I flew again 6 months to the day after the accident. Technical Aspects of LT Gallagher's Mishap by AME1(AW) Jung, a Navy Safety and Survival Systems Technician who was the VA-95's Aircrew Life Support Systems (ALSS) Quality Assurance Representative at the time of Keith Gallagher's mishap..
A friend and former naval aviator Bob William's forwarded the story and photos of your ejection seat malfunction and chute deployment that occurred in 1991 and I thought you might find my experience of interest. On Nov. 15, 1971, I was on a maintenance test flight for VA 42 in an A-6 A out of NAS Oceana. While leveling off at 10,000 feet, my seat fired leaving my BN LT. John Adair without a pilot and forcing him to eject. 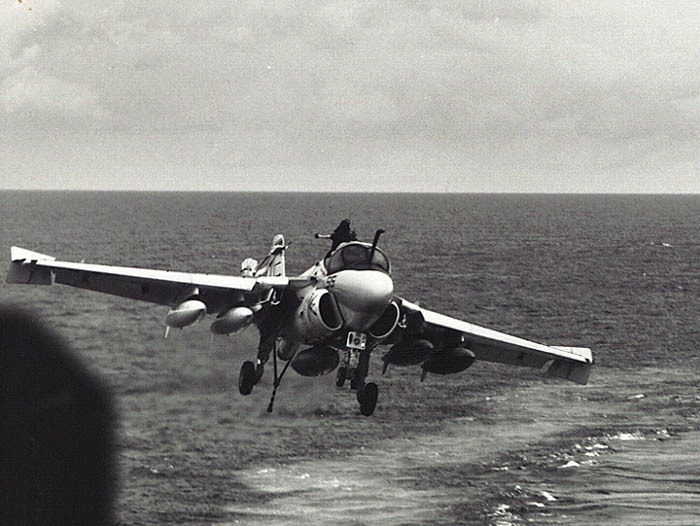 The cause of the ejection was determined to be a faulty drogue gun that fired and ripped the drogue chute out the top of the seat pulling the two ejection seat cables, which initiated the ejection. After I was ejected, I thought I had a midair as I was tumbling through the air and did not know why I was there and assumed the airplane had been torn apart. I did not get automatic chute deployment because the chute was shredded or fouled due to it being pulled through the ejection cables. As I fell I wanted to give up, but something inside kept me working on the problem. After a period, I realized I had the chute pack on my back, but I could not find the D ring due to the wind buffeting, tumbling, and confusion. In desperation, I grabbed the parachute bag and I could see the steel pin and rigging. I grabbed it and gave it pull and the chute deployed. During the accident investigation the seat was found and it was determined that the drogue gun caused the problem. After my accident, the safety center identified five or six other flight accidents that had resulted in fatalities and one probable hanger incident that could have been caused by the drogue gun problem. 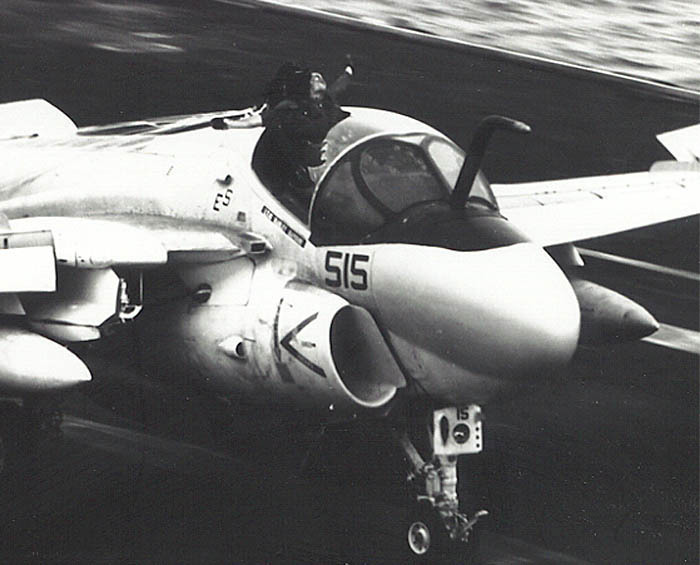 The A-6 fleet of GRU-5 (Martin Baker Back breaker) seats were inspected for excessive play/tolerances in the drogue gun firing mechanism and were replaced. John and I were very fortunate in that we survived and were not injured. I was flying again in 2 weeks and John continued to fly after a short layoff. I am glad you came away from your harrowing experience alive and in one piece. It was one heck of a story and it sure made me think back about my accident. Before I close, I was wondering if you have a relative by the name of Bob Gallagher who served as an advanced jet flight instructor in VT 26 during the late 60's. I had an instructor by that name and he was terrific teacher and aviator. Publishing the text, photos, images, sound clips and video from this site to any web site available to the general public is not allowed without the permission of Mark Gallagher and only non-commercial purposes will be considered.